2017 marks the 50th anniversary of TVB and the launch of free wireless TV broadcasting in Hong Kong in 1967, which turned television from a limited media channel for a small audience into a fixture in every household in the city. 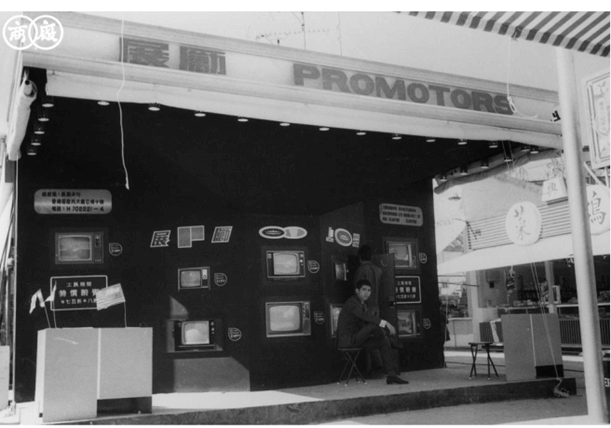 It also led to the creation of the television set industry in HK and a pioneering electronics firm by the name of Promotors Ltd (展勵有限公司) had the distinction of being the first manufacturer of television sets in HK with its Peacock brand of TV sets (孔雀牌電視機). Founded in 1966 and dissolved in 1986, Promotors was also involved in many other electronic products such as electronic calculators, video game consoles and even face massagers. Left: Raymond Koo (right) as director of Shui Hing Co with British store window display expert Mr. Wilson in 1966 (Kung Sheung Evening News, 1966-2-12) Right: Portrait of Koo Shui-ting from his memorial booklet with calligraphy by fellow Hakka tycoon Aw Boon Haw of Tiger Balm/Sing Tao fame. Raymond Koo (古鑫祥), the founder of Promotors, is the fourth son of Koo Shui-ting (古瑞庭 1902-1946), a Mauritius Chinese merchant of Hakka descent who founded the Shui Hing department store in HK in 1926. When his father died of a heart attack in 1946, Raymond’s mother and older brother Daniel took over Shui Hing. 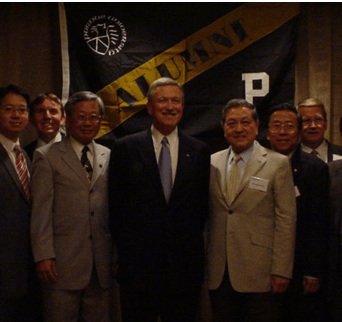 After receiving his chemical engineering degree from Purdue in 1956, Raymond worked for Allied Chemicals in the US before returning to HK in 1964 to join the family business. When the government decided to open up TV broadcasting in 1965 by awarding the first license to provide free wireless TV broadcasting in HK, Koo sensed significant upcoming demand for TV sets and formed Promotors to manufacture TV receivers. As discussed in other articles earlier in the group, the electronics industry in HK began in the late 1950s with transistor radios which took off very quickly and by the mid-1960s, electronic components such as capacitors, transistors and transformers were also manufactured locally. Television sets however were more sophisticated and components such as picture tubes and scanning coils had to be imported. As a result, about 70 per cent of the components in the early Promotors models were imported from Japan, the United States, Germany and the UK. When TVB was launched In November 1967, Promotors rolled out its 19 and 23 inch screen dual standard (for wired and wireless) monochrome TV receivers and 9 inch screen AC DC portable sets (which weighed 11.5 pounds and was priced at HK$485), under the brand name of Peacock. The initial target output of 1,500 receivers (500 dual purpose sets, 1000 portable sets) per month, and the products were priced at 20 less than equivalent TV sets manufactured by the 20 or so overseas manufacturers that were available in the market at the time. According to FEER in 1968, the local market for TV sets (which was estimated at US$2 million) “have not yet gathered full momentum” and as a result, Promotors also relied on export sales to Europe, US and Southeast Asia. As of 1976, Promotors was 50% owned by Hutchison International with two representatives on the board (Peter Wight and Roger Wickins), while the Koo family’s Promol Holdings (展達有限公司) retained the other half with Raymond and John Koo sitting on the board. The firm operated out of the International Industrial Building at 175 Hoi Bun Road in Kwun Tong since the 1960s. Aside from televisions, Promotors also developed other electronics devices. 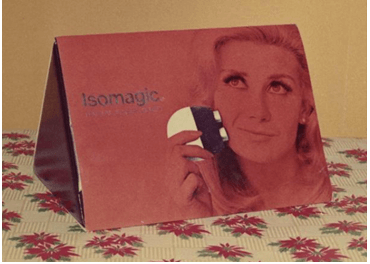 In 1969, it launched Isomagic, a compact and portable face exerciser based on isometric principles with sealed transistorised module, which won a number of awards. In 1973, its electronic calculator, which could display date and time, won the CMA New Products Award in the business products category. When video games became popular in the late 1970s with the rise of Atari, Promotors also got into the business by developing the Palladium game console with twin detachable joysticks for 2 player gaming. Stephen Chang Lien-hing, who later founded Innovative International which was known as the king of car antennas before its collapse, was an engineer at Promotors who worked on the video game initiative. By the 1980s, the Japanese, Koreans and Taiwanese had dominated all aspects of the electronics industry and competition in the TV set business was particularly intense with competition also coming from newer local players such as Conic, Great Wall and Luks. With this backdrop, Promotors was dissolved in 1986. This article was first posted on 16th October 2017.